Project: Northwood Primary School, Darlington. Above: photographs of the existing north (left) and south (right) elevations. 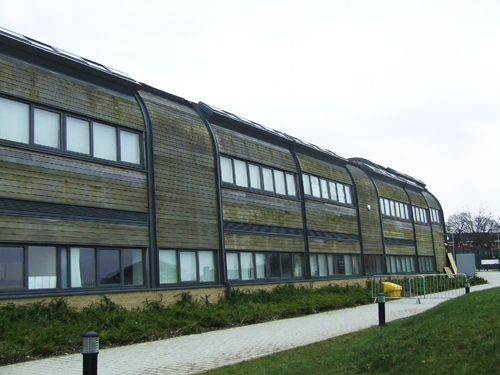 Note the green algal growth on the north elevation and the numerous roof penetrations to the south elevation. Designed by Atkins, and built by Kier, for Darlington Borough Council, this £6.5m building won an RICS Award for design and innovation on a “pioneering sustainable building”, with a “living wall” and a “green roof” in October 2012 at the RICS Award Green Final at The Savoy in London. 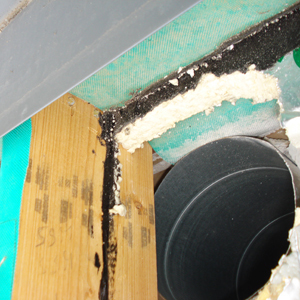 However, and notwithstanding the issue by the architect of Certificates of Sectional Completion, and of Making Good Defects, in November 2012 we were approached by the Contractor, Kier to investigate problems with leaking roofs and windows, dating back as far as August 2012. We arranged to examine the detailed design of the external envelope of the School, and to undertake limited site investigations and opening-up of the fabric. The building itself, some 40 metres long, 20 metres wide and up to 7 metres high, is of timber-frame construction, using massive glue-laminated frames, clad with factory made insulated panels of plywood bonded to either side of a layer of thermal insulation. Internally, to walls and roof, the construction is supposed to be lined with a continuous vapour control layer, whilst externally cedar boarding is secured to timber battens with an external breather membrane intended to protect the plywood shell. At all of the penetrations through the external envelope, for windows (of which there are a considerable number), doors, and all services, both membranes must be lapped and sealed to one another. Careful investigation indicated that no lapping and sealing had been undertaken. And, consideration of the design indicated that, in practice, no such sealing had been envisaged by the design team. 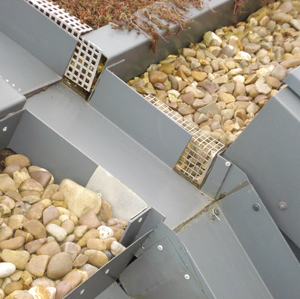 Above: gutter detail and lack of seal around service penetration of external envelope. In addition, the whole north wall, including the windows, had been inclined backwards by some 4 degrees to achieve the required design effect. Unfortunately, when combined with an absence of seals between the two membranes, and an absence of any system of integrated dpcs and cavity trays at the heads and cills of the windows, water was free to enter the building fabric causing discolouration and damage to the interior. In addition, the failure of the design to consider the need to lap and bond membranes in three dimensions (not two!) meant the design, and the construction allowed water vapour from the School’s many pupils to be driven into the construction. 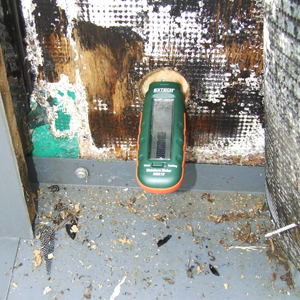 There was in consequence a demonstrable risk of huge quantities of condensation occurring. Calculations demonstrate a figure exceeding 400 gms/m2. 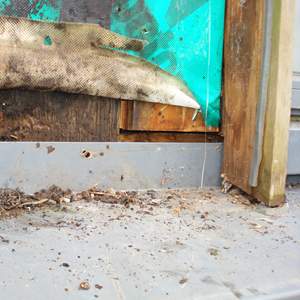 Above: opening-up to expose wet-rot within the construction. Attending on Site in December 2012 we opened-up sections of the structure including removal of waterproof layers from the exterior of the primary structural elements. We discovered extensive rot and decay in the structure, combined with hugely elevated levels of moisture in the timber, in excess of 45%. The notional maximum rate for moisture in timber in construction is 18 – 20%. 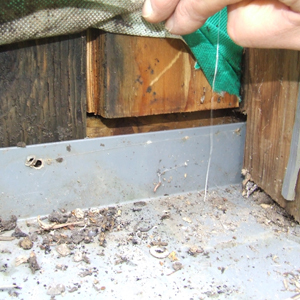 At levels persistently above 26% timber will decay under the influence of wet and dry rot. 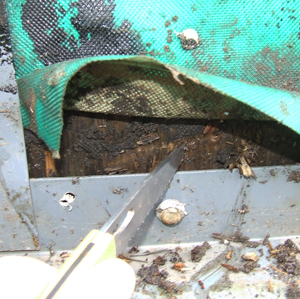 As can be seen in the illustrations, we noted considerable evidence of fungal decay beneath areas of waterproofing removed from the structure. 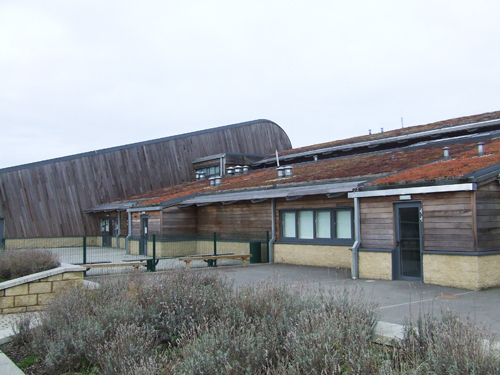 Unfortunately, in selecting the external breather membrane for use beneath the open cedar-boarded cladding, the architects also omitted to note that it was not stable under ultra-violet light and would in due course breakdown leaving no secondary line of defence for the timber structure behind. The moral of the story: for architects, ensure that you design in three dimension, not two. And, if you cannot draw the detail then it probably cannot be built; always undertake condensation risk analysis calculations yourself; and, never sign off a Sectional Completion Certificate unless the Works are complete – do not add a list of “snagging”. And, certainly do not issue a Certificate of Making Good Defects unless you are absolutely certain they have all been made good. For Contractors: recognise the dangers of condensation in construction and always ask the architect for detailed Drawings for all penetrations. Remember, penetrations of the external envelope, be they to roofs, walls, or floors, require exceptional care and attention in all respects. And, unless an Agrément Certificate confirms a membrane will remain stable under the influence of ultra-violet light, it won’t!